Village Whiskey at Revel - Home of AC's Best Burger? If you are not a fan of whiskey, don;t let the name of this bar put you off, as they offer so much more than whiskey. That's not to say their range of whiskies isn't impressive - it truly is, with a huge range of both domestic and imported single malts, blends, ryes and bourbons. But, if what you want is a good beer and some great bar food, then this could be one of the best places in Atlantic City to find just that. The Best Burger in Atlantic City? When it comes to who has the 'best' burgers, you have to say it's all down to a matter of taste. 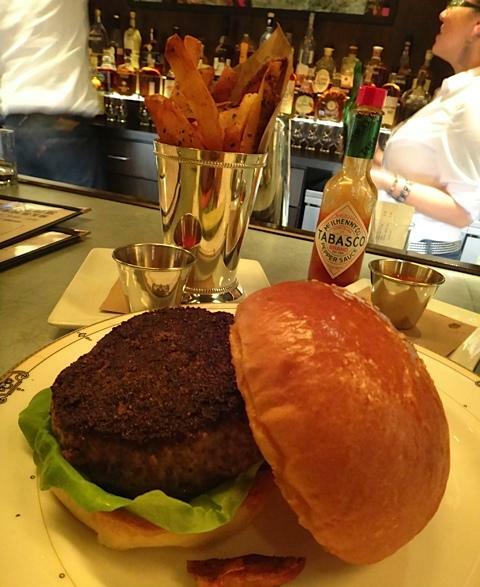 If you are looking for a great burger to try, Village Whiskey have one that's at the top of our list. The Village Whiskey has a real quality burger, made with prime Angus beef, cooked to perfection served with fries cooked in duck fat (how good is that?) and with a pickle that was also up there with the beat off them. Top marks on both counts for me. I started with a superb beer, really hoppy which got the taste buds going, then followed by a very good Pinot noir (this is now my favorite wine grape for a burger) and fold by an excellent glass of rye. Pig whistle rye. To finish off I needed an espresso (the whiskey bar does not sell them) so made my way to the Italian place round the corner and has, again, a perfect (am I using that word too often?) cup - absolutely loved it. Then it was on to the slot floor, the less said abut that the better, but after a meal like that, nothing could ruin my evening. Absolute top marks from me!